INCHING FORWARD – Health and Social Services Minister Pauline Frost hopes to have the terms of reference from the independent expert panel involved in the health care review come forward to her cabinet colleagues in April. Public input will follow, with the report being given to her deputy minister by October. Yukoners will be able to provide input on the health care review after its terms of reference from the independent expert panel come forward to cabinet sometime next month, the territorial government confirmed Wednesday. Clarissa Wall, a Department of Health and Social Services (HSS) spokesperson, explained Wednesday evening there was not yet a hard date set for that public consultation. But she confirmed that it would happen after the expert panel brings its terms of reference for the review itself to cabinet. 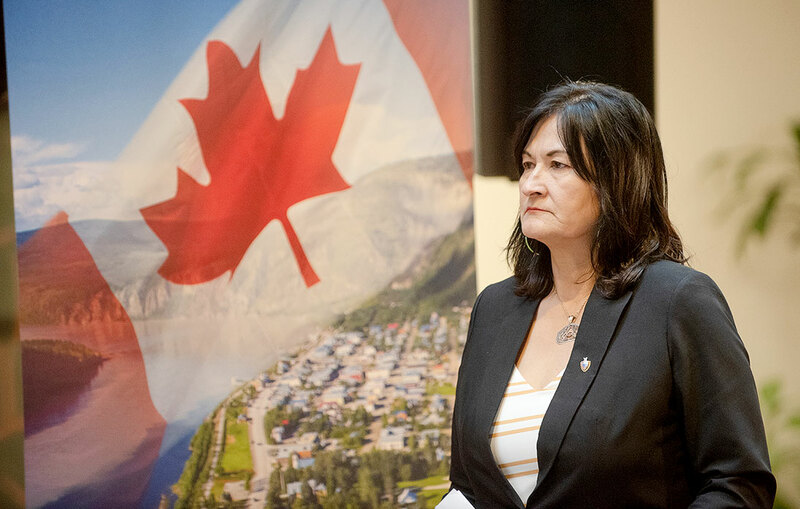 HSS Minister Pauline Frost said this week she hopes that will happen around early April, after being pressed in particular by NDP MLA Kate White for a timeline. White wondered if the terms of reference for the review existed at all, given it had been over four months after the panel had first met in November 2018 (as noted in a YG release announcing the five-person roster last Nov. 11). “At this point in time, they should have been made public – we’re going six months since the announcement of this project,” White told reporters shortly after Tuesday’s question period. In fact, it dates back further; Premier Sandy Silver announced in his March 2018 budget speech that YG would carry out the comprehensive review, adding that almost one in three dollars is spent in this area. “There’s no way you go this far without having a terms of reference,” White said. “If you don't have a terms of reference, there’s no roadmap; this is not a car I want to be a passenger in,” she added. That work is being done as we speak by the panel, Frost assured later. While the government has made public the terms of reference for the panel to follow (via that November 2018 release), it’s that independent body that will produce its own terms of reference for the review. This will include the goods of what exactly is on the table for the review, the timelines associated and ultimately lead to a report with recommendations. In short, Frost said, that means the parameters for the review itself were not hers nor the government’s to divulge, but rather the expert panel’s. “The piece they’re (Yukon NDP) asking for and they’re wanting more details and info on is not yet available because it’s not up to us to prescribe for the independent expert panel the parameters around the work they’re going to do,” Frost told reporters Tuesday afternoon. That was after question period, during which White echoed her concerns about the lack of detail for the review. “That’s the objective of having an independent panel – give them the flexibility to do the work,” Frost said, adding the hope is to eventually make the panel’s work public. Meanwhile, documents referenced by the Yukon NDP last fall showed the expert panel was just one of three bodies involved in the review. The other two were dubbed the tiger team and steering committee, both of which were made up of representative already within the department. That’s something that prompted questions from the third party about the grand total cost of the review last year. Also last fall, the Yukon NDP tabled more than a dozen reports within the department issued over the last decade or so – in efforts to show just how much work there has been done to date. Part of that work includes a similar 2008 report, which is also referenced in the expert panel’s terms of reference. Speaking to reporters this week, White understood the importance of having things like a tiger team to pull together this info. “That was one of the things where I was like this makes a lot of sense – you have experts within the department who are collecting the information for the expert panel to review. Frost confirmed this shortly after. After YG set the parameters for the panel, the tiger team gathered internal work and handed it off to the panel – which is now doing its work. “We couldn’t just open up the books for confidentiality reasons to the expert panel,” Frost explained. As for just how long it could take to actually implement the recommendations of the review, the government does not have a set timeline yet. In the legislature Tuesday, she hinted they may lean more toward long-term fixes. “The review isn’t about immediate cost-savings, nor is it about cutting programs; it’s really about identifying a plan to look at our biggest cost-driver in government,” Frost said of her department. Wall echoed that Thursday, noting there is not yet a date for when the panel’s report will be public. That means the timeline for actual suggestions to be followed is also a hazy picture. “We expect that the time needed to implement recommendations will vary greatly depending on the complexity and details of each recommendation,” Wall wrote Thursday. “Some might take months and others years to be implemented. Much could be hanging on this review; reporters have been told by the department at various times throughout the last year or so it could bring suggestions around medical travel rates, funding for NGOs, access to health care in remote areas and ways to maximize resources in community health centres. “We’ve got all these questions and we always get told we can’t answer it now, we’ve got nothing to say; it’s all going to be decided in the Health and Social Services review,” White said. According to those documents from the NDP, things like medical travel and co-pay arrangements could be up for discussion. The former has prompted questions in the House from both the Yukon Party and the NDP as of late. When a patient needs medical services which are not available in territory, air travel is covered in full for flights to places like Vancouver or Edmonton. A mileage subsidy is available for those who travel by a personal car, along with a travel subsidy of $75 per day. That’s meant to help cover costs of meals and accommodations of patients who are not admitted into a facility, and kick in on the second day of travel. In 2017-18, medical travel costs amounted to $14.2 million, while the following year, YG put aside $12.9 million for the cause. The department’s deputy minister, Stephen Samis, acknowledged as recently as February that medical travel allowances are not enough for the full cost of accommodations. That deputy minister will play a key role in the review, as Samis is expected to have the panel’s final report in his hands no later than October. That may not be when the public can sink their teeth into it, as the panel members will still have time to advise on, review and present the report to him until the end of their contract – currently set for December 2019. @ Groucho. I so agree with your comments. Open and Accountable are currently (and have been for many, many years) nothing but words on a piece of paper. It's time one of these governments actually served the people instead of acting for the sole purpose of avoiding liability. I really like your idea of putting out the Terms of Reference to the general public. Now, how do we get the current government to listen? I know they said they would listen when they were campaigning, but do they? The promises are going to start coming again real soon. Perhaps we could make this (terms of reference for any study, report, review, etc. open to public review) a campaign issue? I believe Terms of Reference (TOR) should be provided to the public for any review the government is planning to undertake, especially with statute and regulatory concerns. They should include in plain English, what problems or restrictions are percieved in the Status Quo; what their motivations are towards introducing changes; and how they will measure the value/benefit of the changes they may introduce. I get the sense that cost cutting is behind much of their efforts as with the review of the Societies Act, but there are no TOR so who is to know what is guiding their review? Open and accountable is simple to do if they have the courage to state their intentions without the bafflegab and generalizations they spout in Question Period. ... and what number is this health care review? How many have been done over the past 8 years? This one will end up sitting on the same dusty shelf as the financial review Slippery Sandy had another "expert panel" when he took office. I guess the mantra here is "When you haven't a clue what you're doing, commission a lengthy and expensive review" in the hope the electorate will forget about the issue. "independent expert panel". Insert belly laugh emoji. What a great minister Pauline has been. Time after time she delivers and things are always tough. I have needed major health care since 2011 and in the last six months I was in hospital 7 times. Fell and had major damage. I cannot say enough about the great work of our health care providers in the Yukon. Keep going we need you very much.